Awareness Mapping with Computer Crafting in Bangalore from jay silver on Vimeo. 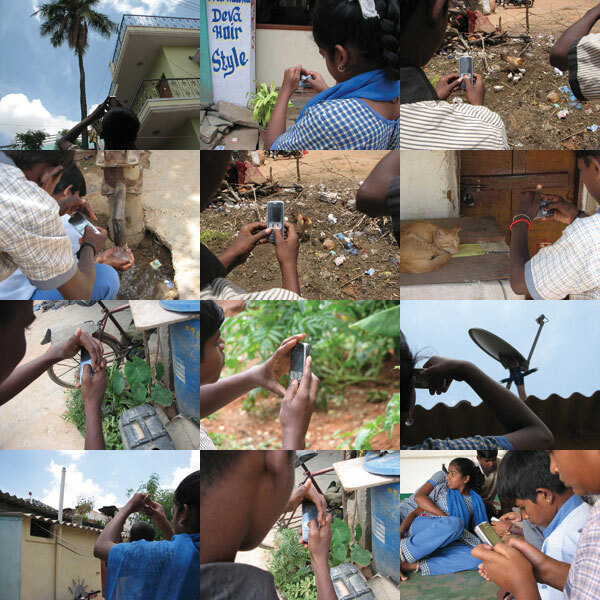 “This video represents the culmination of a one week workshop in Bangalore with children from Drishya, a slum school. The first four days of the week were spent building up to this exhibition. First they took photos of “Nature” as the children defined it within their communities. Then we made a community map with paper popups of their favorite elements from nature. We then acted out the processes and interactions between the elements of Nature and the community using dramatic play as well as puppeteering. Finally, based on the way these elements of nature move and interact through time, we created interactive Scratch projects on Intel Classmates and Nokia N810’s, which we embedded into the community map. The video starts out showing the finished community map, including interactive computer projects “sewn” into the fabric of the paper map. Then the video shows how we had a conversation with the community by taking the interactive elements out of the map into little mini scenario maps and installing them on location at different sites throughout the community to have a conversation in situ. The concept of Awareness Mapping was originally framed by Jay Silver and Karen Brennan and refers to the nonliteral representation of hyperlocal geographies in map format for the purpose of sharing emotions and telling stories. The idea of Computer Crafting is that we can think of entire personal computers (processor, screen, mouse, keyboard, sensors, memory, etc., all built into one) as just another craft element that we can deploy into our creations.